Greetings again from the darkness. 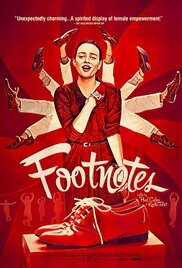 On the heels of success experienced by LA LA Land, and “inspired by the films of Jacques Demy and Stanley Donen”, co-writers and co-directors Paul Calori and Kostia Testut find the right fit with this whimsical musical-comedy that puts coming-of-age and social commentary on equal footing. Pauline Etienne stars as Julie, an eager, hardworking young lady who flip-flops between odd jobs (McJobs) just trying to make ends meet in a tough French economy. When she secures a job as a stocker in a high-profile shoe (not footwear) factory, Julie is determined to buckle down, not step on toes, win over her stern supervisor (Clementine Yelnik), and finally get her life in order. Unfortunately, there are rumors of an upgrade, which in the world of corporate management double-speak means downsizing, or even closing the factory. Julie then spends most of the movie treading lightly between romance, a gruff boss, and her activist co-workers. This is not the kind of musical where the singing voices, original songs or dancing will knock your socks off, but it all relates to the story and nothing seems forced. Feeling threatened, the factory ladies step up their game by singing “Let’s Fight Back” with some creative choreography that makes good use of the warehouse space. One of the delivery drivers (Olivier Chantreau) takes a shine to Julie, even though the boss assumes she is behind the workers’ strike and tries to boot her from the job. Luic Corbery plays the smarmy CEO whose polished misleading statements are laced with charm as he attempts to re-buff the angry protests from the factory workers; all the while scheming to move operations to lower-cost China. With female solidarity and empowerment around her, Julie must decide if she will be the sole outlier, or if this is her chance to find her true self. It’s in these scenes where Ms. Etienne’s real-person screen presence spikes the story with the well-meaning persona that makes us care. The working class dream of a better life is a constant throughout, though the ending is a bit disappointing given what we have watched Julie trudge through. The choreography is not flashy or polished, but rather low key and meaningful. There is a touch of the classic The Umbrellas of Cherbourg (including a song/dance featuring multi-colored umbrellas), and although it’s not at that level, it nonetheless is an admirable and enjoyable film. It should be noted that the original title Julie and the Shoe Factory does not quite take advantage of the wordplay offered by the English title. This entry was posted on Sunday, July 16th, 2017 at 9:21 pm and is filed under Drama, Musical, World Cinema/Foreign. You can follow any responses to this entry through the RSS 2.0 feed. You can leave a response, or trackback from your own site.